Do you know how we all look at Mediterranean women and wonder why their hair and skin are so beautiful? Their secret is Olive oil! But can we use Olive oil on our dogs? Is it ok to use olive oil in a dog’s ears or on a dog’s itchy skin? Will Olive oil make for a healthier coat? Read on to discover why olive oil will become your dogs new best friend. Benefits of Olive Oil For Dogs. The oil that comes from olives has many health benefits for our dogs. Rich in monounsaturated fats, olive oil has been proven to prevent the effects of cardiovascular disease and diabetes in dogs. 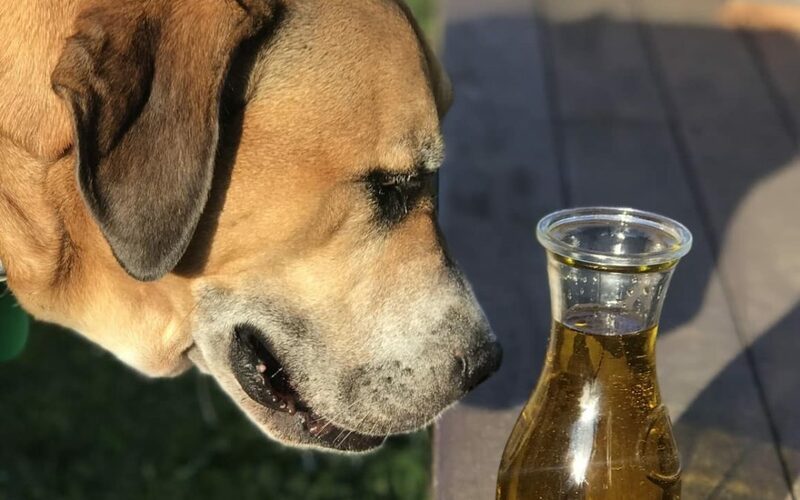 Containing healing properties, olive oil can both ease and prevent dry skin and give your dog a healthy, shiny coat as well as increasing your dog’s energy and boosting her immune system. Mixed with black pepper and turmeric, Olive oil provides the perfect base for the dog lovers Golden Paste, a natural food supplement that helps dogs combat arthritis and ageing. Enjoying This Post? Save It To Pinterest! Is Olive Oil Good For Dogs Ears? If your dog shows signs of having an irritated ear, and you don’t have immediate access to a vet, there are things you can do to ease her discomfort. Starting with massaging her ear with warm olive oil. The fantastic thing about this natural ear treatment for dogs is that it is cheap and is readily available. If you are away from home with your dog and need immediate relief, olive oil will be your saviour. Alternatively, if your dog is being looked after by a dog sitter while you are away from home, this treatment is easy to carry out and is a great bonding experience for both dog and sitter. Take some oil (any kind will do – there have been reports that you should use extra virgin but I have never found there to be any difference). Warm very gently over a Bain Marie (a bowl over a pot of hot water). The reason I am advising this way is that I don’t want you to heat the oil in the microwave. The oil must be warmed gently. The oil must be warm. Not hot. If you have a dropper then all the better, but if not, the tip of a teaspoon will suffice. Have your dog lay down by your side. Soothe her and gently rub her ear. Open her ear flap and carefully place a few drops of the warm olive oil into her ear canal. Massage her ear gently so that the olive oil goes deep inside her ear. Giving Dogs Olive Oil As Part Of Their Diet. Remember what we said about those Mediterranean women? Here’s how you can help your dog to achieve a beautiful coat by including olive oil in his diet. Dr Christpher, a board-certified dermatologist at BluePearl Veterinary Partners in Franklin, Tennessee states that studies have shown how olive oil, which is rich in omega 3 fatty acids, can help to moisturize a dogs coat and potentially reduce inflammation of the skin that your dog may be experiencing due to allergies. How Much Olive Oil Is Safe For Dogs? Doctors recommend adding no more than one teaspoon of olive per twenty pounds of body weight per meal. This is drizzled over your dog’s usual food. Are There Any Potential Side Effects To Giving A Dog Olive Oil? While olive oil contains high levels of antioxidants, including polyphenols, vitamin E, chlorophyll, and carotenoids, it also contains calories! One teaspoon of oil counts for 120 calories, so if your dog is prone to putting on weight, something to be aware of. If you do want to keep the olive oil in your dog’s diet then perhaps increase her dog walking to keep those extra kilos at bay. Although olive oil is considered safe for dogs, there is always the chance that, as in humans, it can irritate those with sensitive tummies. Especially puppies. If you have only recently bought your new pup and she shows signs of an upset stomach or diarrhoea after giving her olive oil then stop adding the oil to your dog’s food. 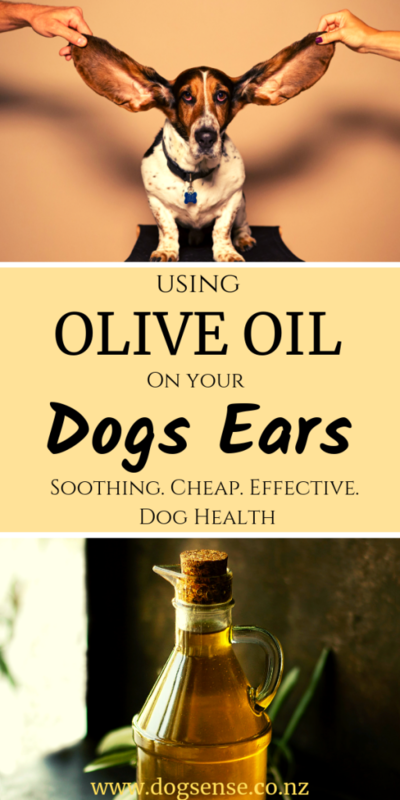 If you have a dog with a sore ear and are asking yourself is olive oil good for dogs ears then I hope you have found the answer to that question. Leave a comment below to tell us what you have used olive oil for on your dog and what was the result!